I originally was going to start this on Monday and do this series of articles before my Puca Trade one, but as talk of Dragons of Tarkir inherent value kept getting worse and worse, it made me think that there weren’t going to be too many changes in standard right away. Don’t get me wrong, I think DTK is bringing a lot of changes to the table, but instead of making tier 1 decks better, it’s simply raising up a lot of tier 2 decks to Tier 1.5 or Tier 1 status. Decks like Blue devotion, BW Warriors, and UW control should see a resurgence in power level that has been about 4 months in the making. Today I’ll be covering white, but before I do so I’d like to go over my choices from last time and see how they did. Brimaz, King of Oreskos – I said to hold on them and wait for another spike to sell them. He was going for $24 last time but now he’s at $22. Maybe now’s a good time to get rid of extra copies. Chained to the Rocks – I said it would see another spike before rotating and it’s currently sitting at $1.75, up from $1.25 last time. I think it has a little more way to go this standard season, but now is probably that last spike I was talking about. I was right about this one. End Hostilities – I guess I was a little early on this one since the price hasn’t changed yet. Not saying that it won’t though. Can’t really say I was wrong saying to pick it up at $2 though. 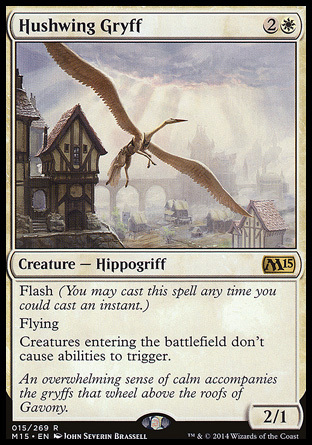 Hushwing Gryff – This card is up to about 500 yen in Japan, and has also seen a slight increase from $2.50 to almost $3 in the USA. I guess the USA is a little slower than Japan on this one, but I still think I knew it was undervalued. Soul of Theros – I said to sell at $4.50, and it’s now at $3.50. Another good call on my part. 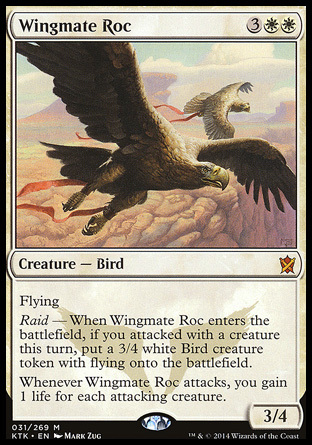 Wingmate Roc – I really didn’t think this card would go any cheaper than $9, but it fell even further to $6. Well, I was wrong on this one. There weren’t really any breakout cards this time that I called, and I think I underestimated just how many packs of Khans of Tarkir were being opened during this period, even with Fate Reforged being out. I thought that some cards had hit their bottom, but that wasn’t the case. On a few other cards, I think I was just early. Let’s see if I can do a little bit better this time with the Dragons of Tarkir metagame. It’s spring time and that means that now is probably your last chance to sell your Theros block stuff at a decent price before most of the cards drop further in price. Some will hold their value, but that will be a select few. Now that KTK is out of the picture, I expect there to be a lot more movement in prices as metagames shift and new decks come into their own or make a comeback. Lets take a look at what we should buy and sell at this point in standard. 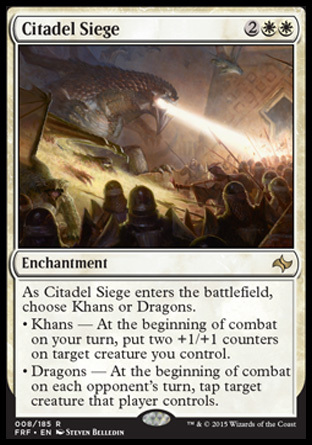 I don’t expect Citadel Siege ($1) to be a huge mover, but it saw some play in RW aggro decks over here in Japan. 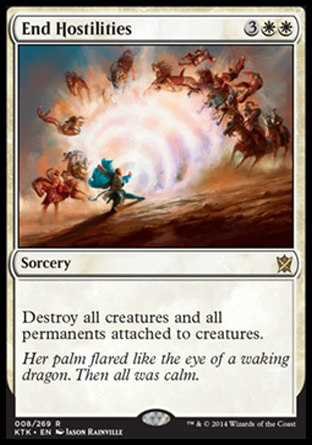 Players would play cheap tokens or a card like Ashcloud Phoenix and then let it get pumped up with counters. It would then use cards like Gods Willing to push through the damage and end the game in a few turns. 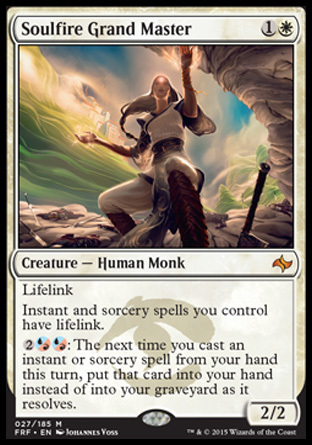 With new cards such as Anafenza, Kin-Tree Spirit and Arashin Foremost, I think mono white decks using this and Mastery of the Unseen are a distinct possibility. This is more of my gamble this time around though, so I’m going to say that this could possibly double in price to $2. I was a little early in my call last time that End Hostilities ($1.75) would see a price increase, but this time I’m almost sure of it. Cards like Ojutai’s Command and Narset Transcendent almost guarantee that UW control will be back in some form. I foresee a lot of UW, Jeskai, and Esper decks being made and they are going to need 4 of these in those decks. I expect it to hit $3.50-$4 by Origins in the summer. I still think Hushwing Gryff is a buy at $2.90. It has has a unique ability that would figure well into modern, especially against decks like Splinter Twin, and since M15 wasn’t opened as much as a set like KTK, there are fewer around. It will be slow, but this card will probably hit $6 before rotation. I expect it to be around $3.50 by Origins or at worst remain steady at about $3. Monstery Mentor ($20) probably has a few more dollars to drop, but I still believe it’s a buy. He’s seen some play in a Esper tokens deck over here in Japan, and I believe the only thing he’s really missing for standard is a good card drawing engine. RW tokens seems like a good spot for him as well now that Dragon Fodder has been reprinted. I think he’ll fall to $17, and at that point I would buy/trade for him. All it takes is for one deck to make use of him and he’ll easily hit $25 again. Draconic Roar added a little bit extra to RW Burn’s arsenal, and I think that other cards like Ire Shaman and Commune with Lava could also improve this deck’s chances, but I don’t see Soulfire Grand Master going up soon because of it. I expect her to drop another few dollars to around $10, and at that point it might be a good idea to grab a few. She’ll be at her cheapest over the next few weeks unless she finds a spot in a break out deck. This card will DEFINITELY start to go up again soon from its current price tag of $6. It still sees play in Abzan midrange decks and a few RW ones, but I think we’ll see it showing up in BW and GW midrange decks as well over the next few weeks. It will be small at first, but I could see it back up at $8-9 by the time Origins is released. Chained to the Rocks is probably going to see a little more play over the next few weeks as efficient removal, so I’d get rid of what you have now. You won’t get $2 for it for long. Hero of Iroas is still hovering around $5 thanks to the affordability of UW heroic, but I think you should get rid of him before his price drops in half. There are some uncommons I think you should also try to get rid of before they become bulk as well. Nyx-Fleece Ram ($1.50) still sees some sideboard play which is keeping its value afloat, but I don’t think it will see any pay after rotation so get rid of them now. I’d also do the same for Banishing Light ($1). The might both see a slight spike thanks to UW control decks seeing more play, so look for the right window and get rid of them when they spike. White definitely isn’t that exciting this time around. Elspeth’s time in the sun has come and gone, as well as Brimaz’s, and all that’s left for us are a few powerful but situation dependent cards. Cards like Mastery of the Unseen have already spiked and shown what they were capable of in Standard, even before they were in standard for a full season. While I expect only a little movement from white over the next few weeks, Wizards faster release schedule will definitely have some repercussions. Less packs will be opened from less than stellar sets such as Dragons of Tarkir, which means when a breakout card from a future set makes a card from a past set worth playing, its price will be more susceptible to large price swings. I see it as being the Voice of Resurgence effect. Being the only chase rare from that set, it managed to hold a $35-40 value most of the time it was in standard. I think we’ll see this happening a lot more often as decks rise and fall in standard. Next time I’ll be covering the blue cards I think will be doing some movement in the next standard. There’s already been talk of mono blue devotion making a comeback, but just how high can those cards go before rotation this fall? Be sure to find out in my next article due out in a few days. Thanks for reading, and if you have any other suggestions or comments about what white cards might be worth looking into, I’d like to hear what you think down below. See you next time.